Do you wish you had a rain barrel to harvest rainwater from your roof — but don’t want to spend $100’s or settle for an ugly blue plastic container? Good — I think you can have a pretty, aesthetically pleasing rain barrel for CHEAP! I’ve got 3 clever ways to turn ugly rain barrels into pretty rain barrels… without spending much money. There are ridiculously priced rain barrels out there that everyone has seen — like these planter/rain barrel combos for $100 and up! So how can you build your own rain barrel that doesn’t cost you an arm and a leg and that you will actually want people to see? #1 – Grow flowering vines down the sides of ugly 55-gallon barrels to make them look pretty. 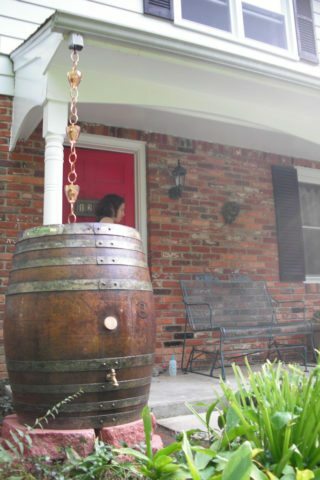 One of my absolute favorite (and cheapest) DIY rain barrel ideas is from designer Michelle Kaufmann. Michelle shares the idea of just spending about $10 to get any cheap 55 gallon barrel. 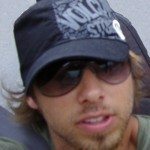 Here’s how to find one for cheap or free. Then she suggests growing beautiful vines up around it on cheap wire mesh and placing potted flowers or plants on top to completely hide it! Michelle Kaufmann also shows you how to ditch your downspout and make your own rain chain to carry your rain water to your new rain barrel! 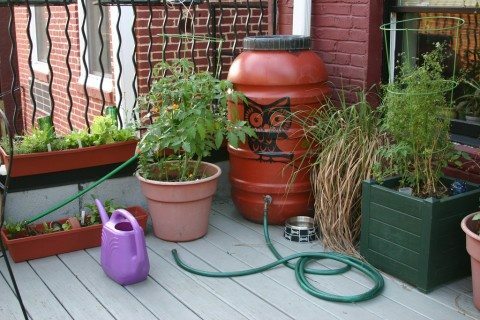 #2 – Paint ugly barrels, place a few potted plants around them, and you have pretty rain barrels. Another cheap and easy way to make an attractive rain barrel is to find a cheap or free 55 gallon barrel and paint it to match your landscaping, home, or give it a terra cotta look. If you can’t or don’t want to grow vining plants around it, as in Michelle Kaufmann’s idea above, you could simply place some potted plants or flowers on the top or sides. If you choose creeping plants, they’ll look nice falling over the side of the barrel..
#3 – Reuse old rustic barrels to make your own wooden rain barrels that look great. Lots of home and garden stores, nurseries, wineries, and the like will sell you used oak barrels that make beautiful and great wooden rain barrels. I happen to live in the heart of whiskey country (within 1-1/2 hours of both the Jack Daniel’s distillery and the Maker’s Mark distillery), so a barrel from one of those locations would work too. You can see a finished example of this type of wooden rain barrel in the top picture above from Kent Rasmussen’s Lincoln Green Scene profile. 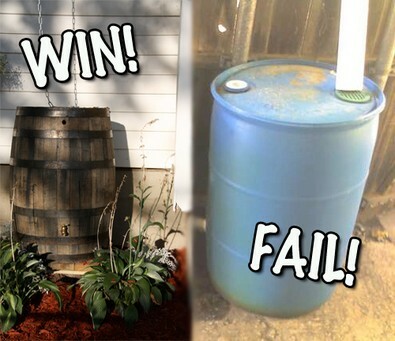 What Do You Think About These 3 DIY Rain Barrel Ideas? Do you think you could make one of them work for your home? Have you found another way to make a rain barrel that you’ll actually want to incorporate into your landscape, not hide behind a fence?